Defence in depth is a military strategy sometimes referred to as elastic defence or deep defence. Defence in depth seeks to delay rather than prevent the advance of an attacker, buying time and causing additional casualties by yielding space. Rather than defeating an attacker with a single, strong defensive line, defence in depth relies on the tendency of an attack to lose momentum over a period of time or as it covers a larger area. A defender can thus yield lightly-defended territory in an effort to stress an attacker's logistics or spread out a numerically superior attacking force. Once an attacker has lost momentum or is forced to spread out to pacify a large area, defensive counter-attacks can be mounted on the attacker's weak points with the goal being to cause attrition warfare or drive the attacker back to its original starting position. 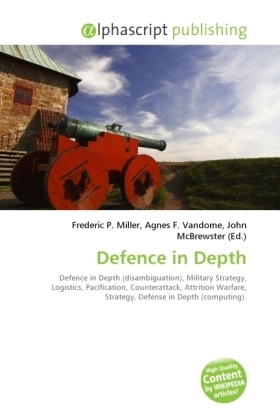 The idea of defence in depth is now widely used to describe non-military strategies.